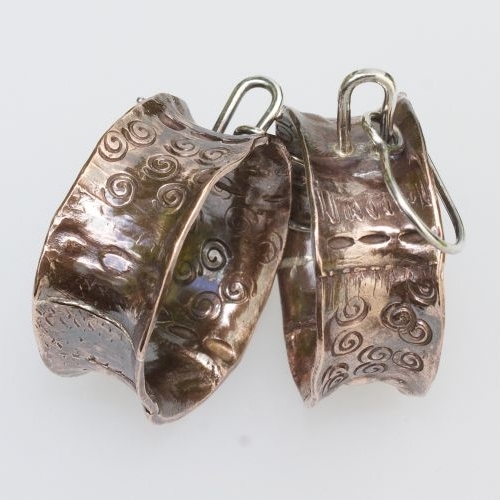 These Fold Formed Textured Copper Dangles are handcrafted from copper and sterling silver. 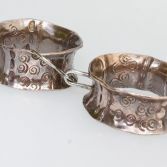 The copper circle/band measures approximately 26.0mm in diameter and the band is12.00mm wide. They have sterling silver loops which are soldered onto the band. 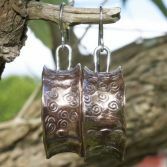 The handcrafted sterling silver ear wires are also soldered to prevent the Copper band from coming loose. These are a one of a kind pair as no two pairs will be the same due to the handcrafted nature of the earrings. Other pairs can be made to order but they may differ slightly, however the images shown are a good representation of the earring you would receive. 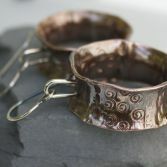 Copper has a beautiful warm quality and is renowned for its healing ability often worn to alleviate arthritis. Your Fold Formed Bangle Textured Dangles will be presented in one of out signature gift boxes and posted via 1st class Royal Mail recorded delivery (signed for) to any UK address free of charge.